Think about the last time you went online to buy something. Have you bought a book on Amazon or Barnes & Noble? Did you look at the book reviews online BEFORE you purchased the book? How about buying any other product online - did you read the reviews for them? How about buying a car - did you look up the pricing and reviews on Edmunds or Kelly's Blue Book online? Or how about a local business or restaurant - did you read review about them on Yelp, City Search or Google Places? Chances are, most of us can say yes to one or all of the above questions. Consumer reviews online have direct impacts on nearly every product and service we purchase today - online or offline. The bottom line is that consumer reviews can either hurt or help you and IT IS UP TO YOU to decide which. Control and promote them and they can help. Ignore them, and you do so at your own peril. 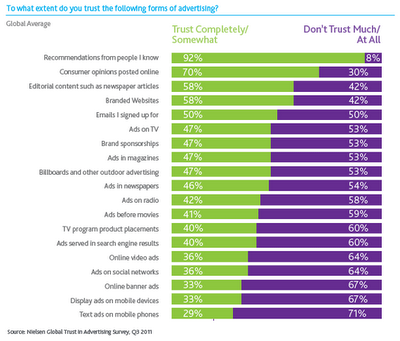 According the Nielsen's new findings (see the adjacent chart), 92% of people still trust recommendations from people they know - this is why referrals will always remain one of the most important marketing arms of your legal practice. This number has increased by 18% since 2007. What is interesting however is that 70% of people will accept the opinions (referrals) for people they don't know - which has increased 15% over the past four years! Looking at the more traditional forms of advertising (interruption based advertising), we see the opposite trend with drops of 24% for television, 20% for magazine, and 25% for newspaper ads from 2009 to 2011...ouch! When is comes to information and reputation management, you can either proactively control it or let it control you. For most attorneys, reputation is everything. In the past if somebody would write a positive or libelous opinion about attorneys in a newspaper or magazine, it would most certainly grab their attention. Just look at the waiting room of any prominent attorney and you will likely see a host of written publications involving them. If this traditional print information was so important to them then, then why is it not a focus now online? After all, looking at the trends listed above, it is clear that opinions on the wall are increasingly of less value then the opinions about them online - a trend you cannot ignore. More on how the create an effective consumer review strategy. Nielsen based its finding on surveys conducted in August and September of 28,000 consumers in 56 countries aimed at gauging consumer perception of 19 advertising formats. Overall, most of those consumers, 92%, say they trust advertisements passed along or recommended by relatives and friends that was the highest score among all the formats. Now days online shopping is done more because they provide us facilities as well as more discount. Therefore E-commerce site's production is rapidly growing and there is no doubt that the webmasters or owners of e-commerce sites are earning handsome amounts. In this digital era people don't have time therefore they prefer online shopping. In this way they save they time as well as money on carriage or visit to stores. This is the reason google start preferring brands website over small business website on their search engine ranking page. Google want to give maximum satisfaction to user through their result and he want that people should search his results and without searching for review do direct sales from google.